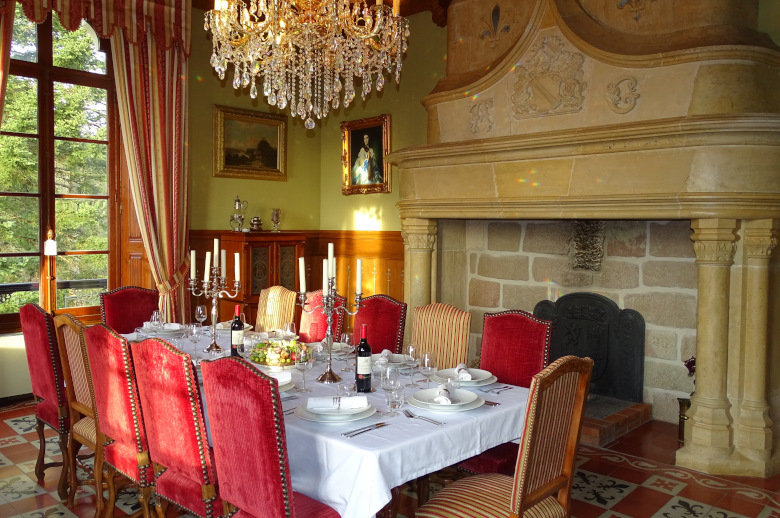 This castle in the Dordogne is excellently located and offers the perfect combination of modern comforts and traditional charm. With its pink walls and turreted towers, it could be plucked straight from the pages of a fairytale. Inside, the castle’s illustrious past has been beautifully preserved, featuring original ochre and black floor tiles and Belle Époque furniture. The reception rooms open out onto the private grounds which themselves enjoy sweeping views of the surrounding green and wooded countryside. This spacious property is packed with character and has a welcoming feel to it. Large rooms with little nooks and crannies ensure that all guests will find a space where they feel right at home. Even the swimming pool seems to beckon guests to gather round. From its slight lofty location, the castle offers an unhindered vantage point over the surrounding landscape. The kitchen is stylish and homely, with a seven-hob range cooker at the ready to rustle up big meals to share with good company. 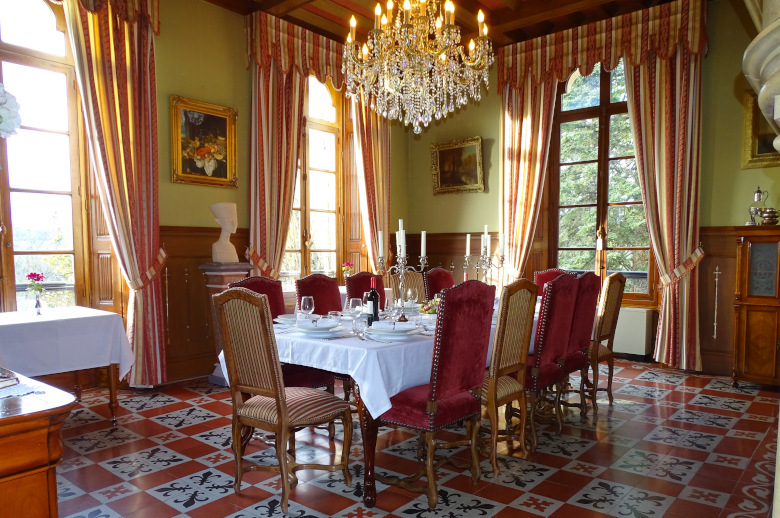 This chateau is ideal for family gatherings and large groups, with an easy atmosphere and plenty of space so that guests can enjoy time together without compromising their privacy. Sit and chat in one of the various lounges, challenge friends to a game of pool, grab some quiet time in the library or have coffee in the garden. Almost all the downstairs rooms lead out to the garden, making outdoor living easy. The Dordogne, which is part of the wider Périgord region, is a rural corner of France where the countryside has been carefully preserved. Périgord is divided into different coloured areas; green Périgord which is dotted with oak and horse-chestnut forests; white Périgord, so called because of its chalky soil; and purple Périgord, the wine region named after the grapes and vine leaves. We're close to Perigord Noir here, which gets its name from the dark bark and leaves of its oak trees. Visit the nearby towns which have proudly retained their past, such as Brive-la-Gaillarde with its mediaeval architecture, or Sarlat-la-Canéda, where you’ll find prehistoric caves worthy of the famous Lascaux caves as well as being the local foodie capital. Food is rather a big deal in the Dordogne – this is the home of fragrant black truffles and foie gras, and Périgord strawberries which are the crème de la crème as far as strawberries go. You’ll find all these goodies at the local markets in the main towns. Fill up a basket of delicious wares and enjoy picnicking by the water’s edge in between a spot of canoeing on Lake Causse or before heading off for a leisurely afternoon at a nearby museum. This property can comfortably accommodate 2 families or 5 couples. - Bedroom 1: 50 m² suite with a double bed (made up of two 90cm-wide singles), with en-suite shower room and toilet. - Bedroom 2: 40 m² suite (made up of two 90cm-wide singles), with en-suite bathroom with a bath and large shower, and toilet. - Bedroom 3: 50 m² suite (made up of two 90cm-wide singles), with en-suite bathroom with a centrally-placed bathtub, shower and toilet. - Bedroom 4: 33 m² suite (made up of two 90cm-wide singles), with en-suite shower room and toilet. - Large bathroom with bath shower and toilet. - 10m x 5 m swimming pool with a semi-rigid safety cover, hot shower. - Brive-la-Gaillarde, approximatively 20 kilometres away: the biggest nearby town and with a strong historical feel to it (think narrow mediaeval streets). Meander through the old town to admire the historic architecture. Don’t miss the farmers market on Tuesdays, Thursdays and Saturdays for fresh local produce. - Sarlat-la-Canéda, approximatively 40 kilometres away: another town which has preserved its Middle Ages origins with beautifully restored buildings and monuments. This mediaeval town comes alive on summer nights, just like it would have done in the olden days; gas lanterns are lit so that the historic buildings glow softly in the light creating an almost magical atmosphere. - Lascaux caves (30 km): go even further back in time to the prehistoric age when cavemen adorned their walls with frescoes, which have been perfectly preserved. The original caves can no longer be visited for conservation reasons; however, an identical replica is just like the real thing and you will be blown away by the artistic talent of our prehistoric ancestors. - Rocamadour castle (70 km) is flanked against the rockface and is the second biggest tourist attraction in France. It’s well worth travelling a little further afield to explore it. The entire town clings onto the cliffside at giddying heights. There are a good number of stairs to climb, but you’ll be rewarded by the stunning views from the top. - Lac de Causse is a great place to spend a relaxing afternoon. Soak up the sunshine on one of the lake’s three sandy beaches or jump in the water to cool down. Activities include rowing, canoeing, water-skiing, windsurfing and pedalos. - Le Gouffre de la Fage: get ready to go underground! You’ll go 25m beneath the surface through a succession of rooms. The colour of the rock varies so much that the walls could almost be mistaken for tapestries. Resplendent organ-shaped limestone formations play ever-changing music. Bones and remains from now extinct species have been discovered here, and the archaeological discoveries are far from over.